What’s for dinner this week? How many times a week do you ask yourself that question! Check out our menu and recipes for this week. 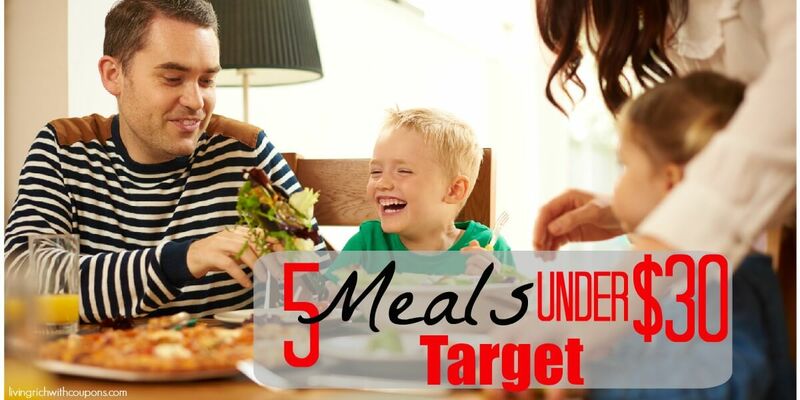 We are basing our menu on the great deals that you can pick up this week at Target. Everything can be purchased at Target and your cost will be less than $30! Our recipes are geared for a family of four, unless otherwise noted. That’s an average of $6 per meal or $1.50 per serving. How awesome is that! You might find that you already have some of the items listed on the shopping list in your stock pile so your out of pocket cost will be even less! Just so you know, some prices may vary at your local Target. Don’t forget to use your Target Red Card to save 5% off your purchase!